Despite restrictions on individual liberty, Cuba has sought to maximize its collective human potential, and since the Revolution its education system is without a doubt one of its greatest success stories. Prior to the Revolution, over one quarter of the population was illiterate, teachers were unemployed, 70% of the rural population had no schools, and there was not a single state-supported library in the country. Beginning with the great literacy campaign in 1961, the government followed up by establishing thousands of new classrooms in the countryside, introducing traveling libraries and making education free to everyone. The result today is that the average Cuban has completed nine years of school, 4% or 400,000 people hold university degrees, and another 1.3 million have degrees from technical schools. For the visitor, these statistics translate into everyday conversations with educated and evocatively philosophical people, who are highly knowledgeable and intellectually inquisitive. Cuban schooling stresses linguistic and math skills at the primary level; and vocational and technical training at the secondary level. Although opportunity is available for all children, the educational system is nonetheless competitive and the best students matriculate into prized vocational and specialist schools or one of the universities. However, many senior students have little choice of professional study, and coupled with a literary panorama that is severely circumscribed by politics and the constraints of the current economic system, Cuba is seeing some rise in truancy and illiteracy. One unique aspect of the Cuban educational system is its emphasis on combining learning with work. Beginning in 1971, the "schools in the countryside" program had all secondary schoolchildren spend time each summer working in the countryside, dividing time between study and labor as part of their education as young revolutionaries. 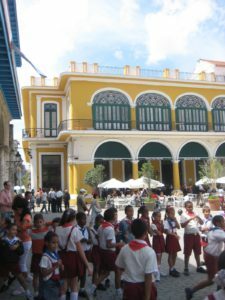 Cuba Cultural Travel maintains on-going relationships with reputable schools and universities as well as professional teachers and professors, enabling us to provide you with the best resources for your learning, researching or cultural exchange experience.